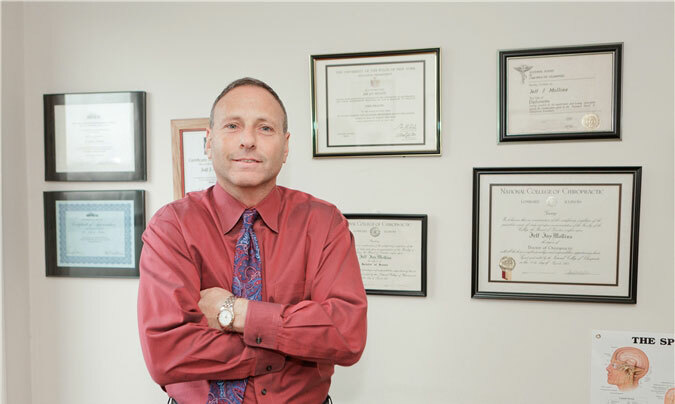 Dr. Jeff J. Mollins, born and raised in Brooklyn, has been practicing consecutively in Downtown Brooklyn for over 25 years. After attending Sheepshead Bay High School, he graduated from the State University of New York at Stony Brook. He then attended and graduated from the National College of Chiropractic in Chicago, Illinois in 1983. He received a B.S. in human biology and Doctor of Chiropractic. Dr. Mollins is a Diplomate of the National Board of Chiropractic Examiners. He is certified in physiotheraphy, theoretical and clinical laboratory diagnosis, x-ray and spinography, as well as dissection of the human body. He is also a Medicare provider (X19311), and certified by the State of New York to provide both treatment and peer review for injured workers by the NYS Workers Compensation Board (CO3541-2). He regularly attends post graduate seminars to keep himself abreast of the latest technology, advancements, and treatment options for his patients. Dr. Mollins specializes in the treatment of people who have been injured at work. His goal in treating “work injuries” is to get that patient better and back to work as soon as possible. His office provides expert, caring treatment that is specific for every individual patient. Dr. Mollins also refers his patients to specialists, such as neurologists, orthopedists, pain management etc., in order to provide every patient with comprehensive care. Our referred specialists are also certified to treat workers compensation, so not only will you receive quality care, but all injuries will be properly documented. Documentation and proper “paper work” is extremely important when it comes to workers compensation. Remember, you can be treated for injuries sustained at work at no cost and be paid for your time out from work as long as proper documentation is provided. Even when you return to work, you can still receive treatment free, as long as the “paper work” has been completed. Dr. Mollins is meticulous with all documentation so that every person injured at work will receive proper compensation as expeditiously as possible. The Workers Compensation office in Brooklyn is easily accessible with a warm and courteous staff. Many of our employees have worked in the office for ten years or more. Patients are our most important asset and we are committed to developing a long lasting, trusted relationship with all of them.